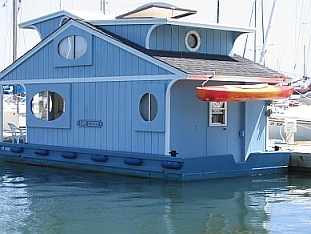 Cape Codder, The Ultimate in Houseboats! 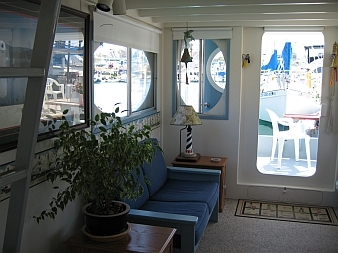 Our Cape Codder is the result of years of requests for a liveaboard/cruising houseboat. The Cape Codder makes it possible to have your own private waterfront home! Everyone has dreamed of living on their own boat and here is the perfect answer! The Cape Codder is a home. It has a couch and end tables, a diningroom set, a complete galley and a head with a shower and toilet! There is plenty of cupboard and drawer space. The inside ladder leads up to the sleeping loft, which has room for full sized mattresses and more storage space. The forward wall opens up to enjoy your own private sundeck. A roof skylight lets you sleep under the stars. This boat will sleep 6 people comfortably! This is a shot of the rear of the Cape Codder. You can see that there is a rear door leading to the deck in the back of the boat. You can hang your smaller tender boats on the rear and/or the front! We put our kayaks on the back, and the front holds our mini tugboat tender, the "Cranberry". She is a Micro 9. This is a shot of the dining area and the kitchen in the Cape Codder. 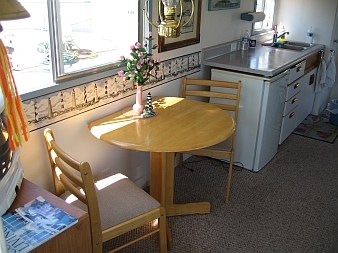 You can see that there is plenty of room to move around and a great galley kitchen, complete with microwave! 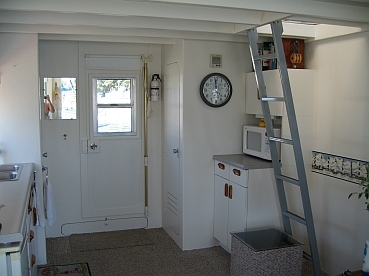 This is a shot of the microwave area and the ladder going up to the sleeping area. You can see the door to the right...this is to the head. There is a door on the left side, also, which is a full-sized pantry. This is a shot taken from the front of the boat. You can see that the deck door upstairs is open, which gives you a wonderful sundeck to relax on and view the world from. This is another shot of the downstairs inside the Cape Codder. You can either put a pull-out sofa or a futon to make more sleeping room on the boat, or put in a regular sofa, whatever fits your personal family needs. 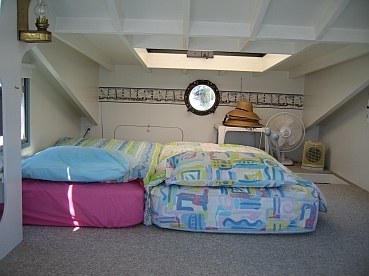 This is a shot of the upstairs sleeping area in the Cape Codder. There is plenty of room for two twin mattresses along with more sleeping area should you need it. 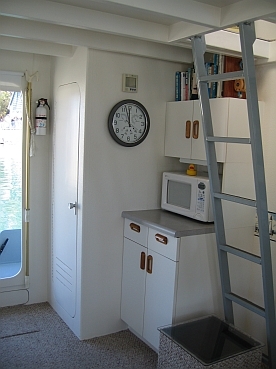 This is a photo of the inside of the rear of the boat. In this shot you can see the doors to the head, the pantry, and the door that leads outside to the transom of the boat. The box visible in front of the ladder is a viewing tank...we built the box, which is open to the underwater, covered it with a plexiglass lid, and can use it to watch the beautiful fish as they swim past. The kids lift the lid and feed the fish, too, which provides hours of entertainment! 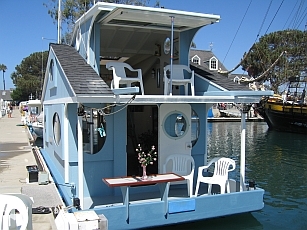 Kent Griswold has a wonderful website about mini homes, and has included the Cape Codder on his site in the "mini floating homes" section. Please be sure to click below and go see his site! He did a great job! Thanks, Kent! Click here to see the Mini Floating Homes Site! 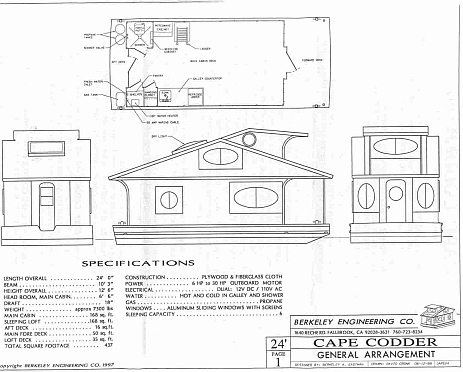 Above is the specification sheet for the Cape Codder 20. Below is the specification sheet for the Cape Codder 24. If you right click with your mouse on this photo and save it to your desktop, you can then blow it up to see the figures a bit better. You can see the layout of the boat. The Cape Codders are an absolute delight! 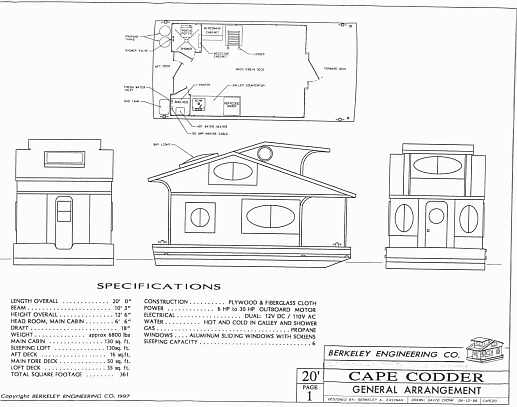 «Click now on our Order Page to IMMEDIATELY order your set of plans for the Cape Codder! If you want a little more information, order a Houseboat Information packet. 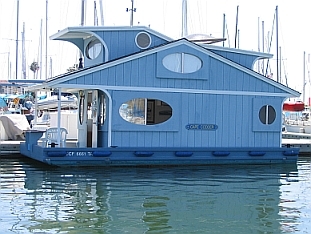 This pack will answer any further questions that you may have about this incredible houseboat! *NOTE: The Information Packet has information about the Aqua Casas AND the Cape Codder.